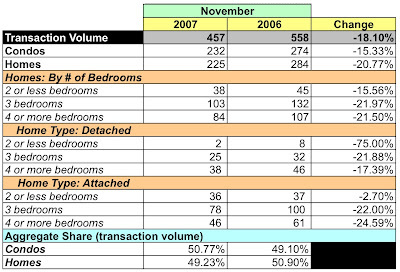 I've finished my analysis of full value residential sales the District recorded in October 2007. Generally, sales volume in the District is down significantly, condos are tanking, yet single family homes continue to see price appreciation despite falling sales volume. While Case-Shiller shows that existing home prices in the DC metropolitan area have fallen, my data imply that District home prices are faring well. It's important to note that Case-Shiller excludes condos from its analysis. And the mystery about 1010 Mass continues: not one unit has closed. Is it about to join Senate Square and McGill Row and go apartment? I hope each of you has a healthy and prosperous 2008! Happy New Year! 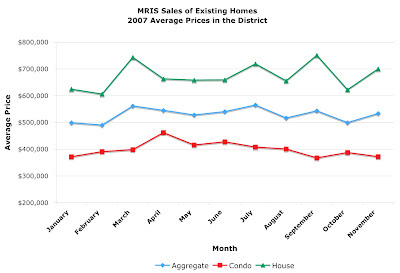 In October 2007 the District recorded 384 residential sales, 44.59%% less than the same month in 2006. For the first time that I can remember, more than half of all units sold were homes. Moreover, homes trounced condos in dollar volume, 62.83% compared to 37.17% of total dollar volume. All but three wards had a decent month in terms of prices. Only one ward experienced declines in average and median prices while two others had lower average or median prices. However, all wards had lower sales volume, some of it quite significant [e.g., -62.58% in Ward 2]. Ward 3 had the highest percentage increase in average price, 15.57%. 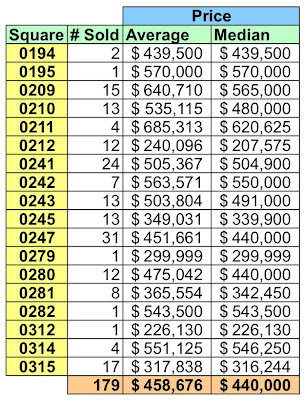 Condo sales continue to dominate Wards 1 and 2. In Ward 1, 74.6% of sales were condos and in Ward 2, 77%. The chart below shows the distribution of October's recorded sales by sales price. In the aggregate, average prices were up 8.8% and median prices increased 1.69%. 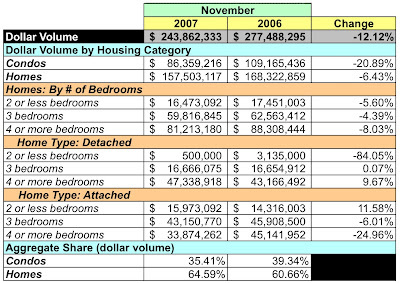 Sales volume collapsed, down 44.59%; condos fell 52.55% and homes declined 34.22%. 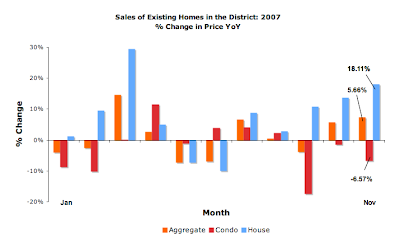 Rising home prices counterbalanced falling condo prices. Although overall demand for single family housing is down 34.22%, aggregate average prices rose 18.27% and median prices grew 6.54%. All categories of houses had large declines in sales volume, but the significant price gains for detached homes again carried the segment; although they comprised less than 30% of units sold, detached homes represented 47.83% of dollar volume for homes. Ward 3 has the honor of having the highest average and median prices in the District. 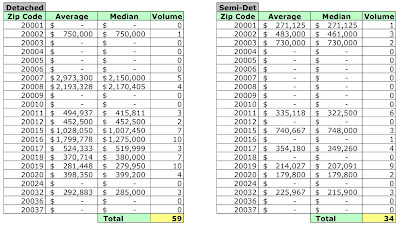 October 2007 average and median sales prices and unit volume by zip code. 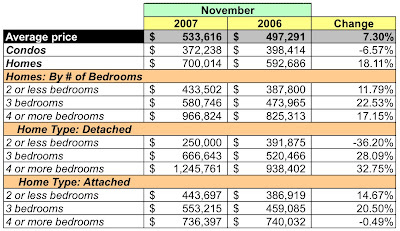 October 2007 average and median sales prices and unit volume by ward. Prices fell 6.1 percent from October 2006 in 20 large metropolitan areas, according to Standard & Poor's/Case-Shiller indexes, compared with a 4.9 percent decline in September. All but three of the 20 regions saw real estate values fall, and even the three places — Seattle, Portland, Ore., and Charlotte, N.C. — where prices were up from a year ago saw prices fall from a month earlier. 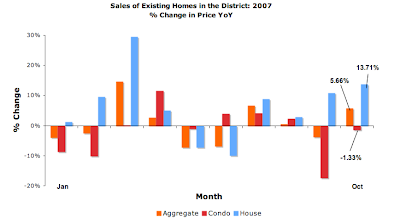 To me, the ominous data point is the increasing rate of month/month decline in the DC area. I've uploaded data for residential sales the District recorded in October to DCHomePrices.com and DCCondoPrices.com; it's available for viewing now. The data analysis is forthcoming. The holidays have kept me pretty busy this week, hence the relative silence since Monday. I've finished my analysis of full value residential sales the District recorded in September 2007. When I looked at August's data, I asked "is that a train headed our way?" Remember that MRIS' data was of contract value signed and the District's data is of sales recorded. Given that both went negative in September, I assume this means that contract signings and closings fell apart in late August and September, all of it most likely due to August's credit crunch and the associated market uncertainties. The market's soured to the point that some new condo developments, e.g. Senate Square and McGill Row, have gone apartment. 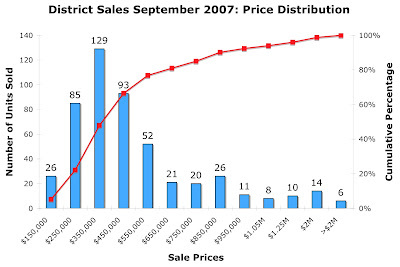 In September 2007 the District recorded 501 residential sales, 28.63% less than the same month in 2006. More than half of all units sold were condos while, in terms of dollar volume, homes led 57.29% vice 42.71%, both consistent with past months' results. 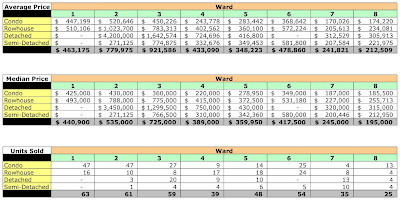 Viewing the data at a District level, four wards had a decent month in terms of pricing. 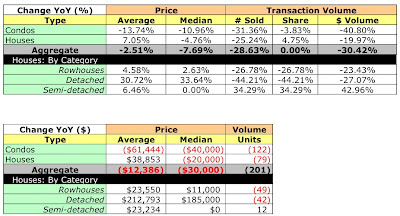 Four wards experienced declines in average and median prices. However, all but one ward had lower sales volume, some of it quite significant [e.g., -40.17% in Ward 1]. Ward 3 had the highest percentage increase in average price, 10.54%. Condo sales continue to dominate Wards 1 and 2. In Ward 1, 62.9% of sales were condos and in Ward 2, 88.68%. Average prices were down 2.51% in the aggregate, median prices down 7.69%. Sales volume collapsed, down almost 28.63%; condos fell 31.36% and homes declined 25.24%. However, average home prices rose despite lower sales volume. Significantly missing from this list is 1010 Mass. What's going on with that building? It looks like its completed. Although overall demand for single family housing is down a whopping 25.24%, aggregate average prices rose 7.05% while median prices were down 4.76%. All categories of houses had large declines in sales volume, but the significant price gains for detached homes carried the segment. Wards 3 and 4 accounted for 69.8% of detached home sales. 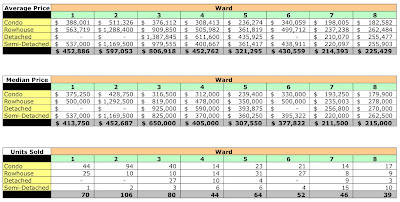 Ward 3 has the honor of having the highest average and median prices in the District. 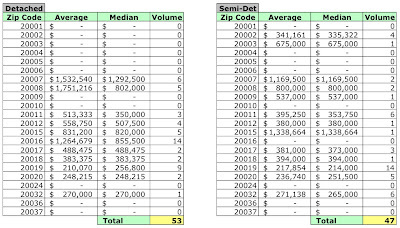 September 2007 average and median sales prices and unit volume by zip code. 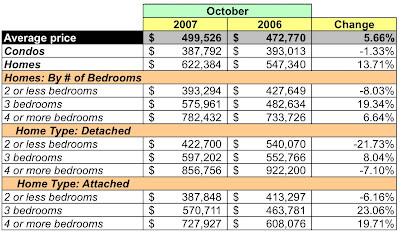 September 2007 average and median sales prices and unit volume by ward. After wrestling with a very long line at French customs, racing to catch my plane, and watching four movies on my Air France flight, I'm slowly getting back into the swing of things. Among the things I can tell you is that $1.50/euro makes for a very expensive trip and that Air France's on-demand in-flight entertainment system is great - there's nothing like being able to fast forward through the "action" sequences in "The Bourne Ultimatum" to cut to the chase, so to speak. I see that the latest S&P/Case-Shiller Index shows a YoY 6.6% drop in home prices for DC. MRIS' blog had kind words to say about this site today. 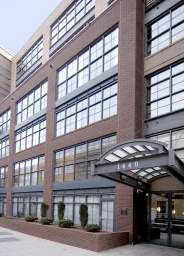 1440 Church St NW #504 has apparently gone under contract. I'll finish for this evening with a photo of a Parisian real estate agency window located on Avenue Mac-Mahon. Multiply the prices by 1.5 to get the US dollar-based price. I can't speak to whether the prices are high or low, but ~$730,000 will get you a 4th floor 3 room apartment near the l'Arc de Triomphe. It's approximately 600 sq ft in size and includes a wine cellar [click on the photo, look at the ad, upper left]. And mortgage interest is not deductible in France. Despite their best efforts, ni cheminots ni professeurs ni fonctionnaires going on strike will stop me from catching my Air France flight to Frankfurt Wednesday night for Thanksgiving dinner in Wiesbaden. I'm just glad I didn't leave Tuesday. I'll be back the first week of December, raring to go to analyze September's sales in the District and create more heat maps, although mine aren't nearly as neat as these [Firefox required]. At least not yet. 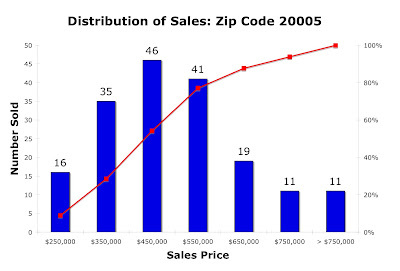 As part of my continuous effort to understand what is selling where, I've begun analyzing 2007 residential sales per zip code per square. 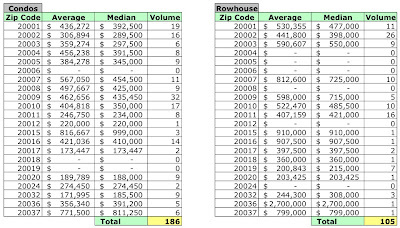 In other words, I've taken 2007 home and condo sales through August 2007 [the last full month of data I have in my database] and, for each zip code, determined sales for each square in the zip code. For my first such analysis, I thought I'd look at zip code 20005, home to Logan Circle and part of historic Shaw. The area has undergone a lot of renovation and development in the past 10 years; I've reported on quite a few condos that have been built there since 2003 [Lofts 14, Lofts 14 Two, Saxon Court, etc.]. A good friend lives off of Logan Circle so I've spent a fair amount of time in the area in the past four years, which is striking because when I first lived in DC in the late 80s and early 90s, no one ventured to Logan Circle because it was considered a risky neighborhood. All properties in the District - for that matter, everywhere in the US - are identified by the square and lot on which they are located. The map below shows the squares for zip code 20005 for which the District recorded sales through August 2007. 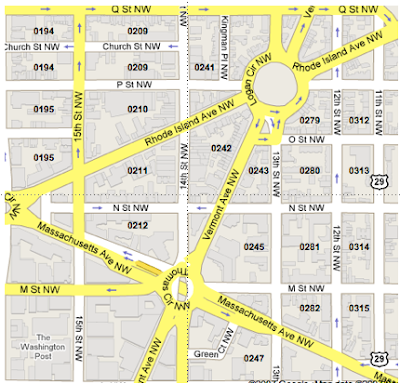 For example, condos located on the 1400 block of Church St NW are on square 0209. For those who know the area, Whole Foods is on square 0210. The district recorded 186 sales in zip code 20005. 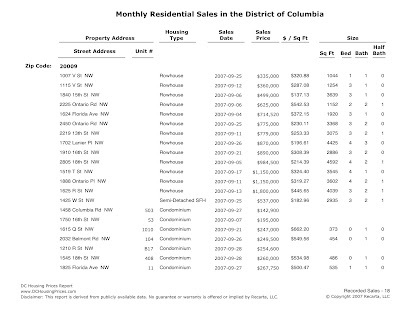 To be consistent with my previous analyses, I've excluded anything the District has not designated a home [rowhouse, detached, or semi-detached] or a condo, leaving 179 sales recorded through August 2007 [multifamily conversions are excluded because I cannot be certain they're truly single family homes]. 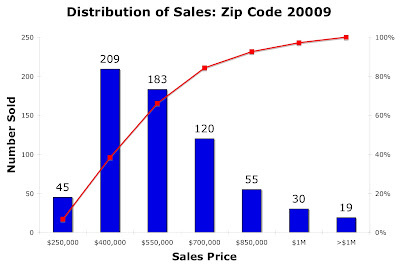 It turns out that all 2007 sales for zip code 20005 have been condos; not one single family home has been sold in the zip code. 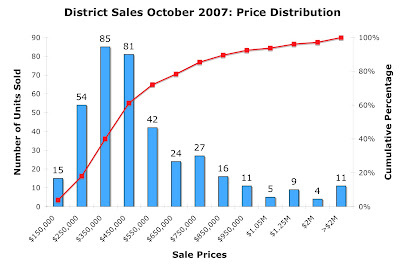 The chart below shows the distribution of sales in the area. As in previous analyses, more than half of the units sold [97 of 179, or 54.2%] were sold for $450,000 or less; $450,000 seems to be the magic number for the District. 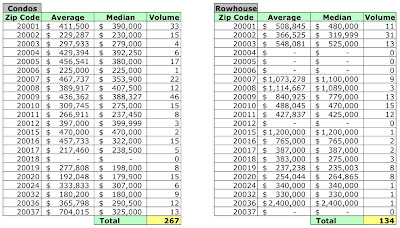 According to the table below, square 0211 has the honor of having the highest average and median sales price recorded in the neighborhood, averaging $554/sq ft.
Total dollar volume for 2007 sales in 20005 is $82,103,001. The legend at right explains the colors used for each pin on the map. 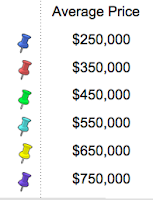 For example, a yellow pin on a square means the average price for the square is between $551,000 and $650,000. You'll get the exact data when you click the pin. There's a long standing relationship between housing prices and rents in each real estate market. Thanks to the real estate boom, the Price/Rents [P/R] ratio in most markets got out of whack. Now that the boom has gone bust, the P/R ratios should begin reverting to their historic averages through a combination of falling housing prices and rising rents. Fortune calculated the P/R for 54 markets and then determined how large a price decline would "bring prices back to their historical relationship to rents." For the greater DC area, they calculated that the P/R ratio in June 2007 was 26.0 while the 15 year average was 15.9. 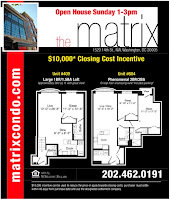 The magazine estimates that prices in the DC market have to fall 38.9% to "return to normal levels." To further illustrate how bad it could get, they took the typical high end home and projected its price in five years [a high end home is defined as one selling for double the local median price]. Fortune estimated the typical high end home in the greater DC area sells for $856,000 today; in five years, they project it will sell for $641,000, a 25% drop. 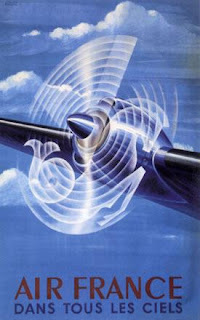 I'll link to the article once [if] it hits Fortune's web site.